As 1963 dawned, John Coltrane was at the peak of his powers and was already regarded as one of the greatest tenor saxophonists of his generation. However, the previous year 1962, had been somewhat disappointing by his high standards. Neither of the two albums he released in 1962, Ballads nor Duke Ellington and John Coltrane were his finest or most innovative albums. Instead, they were a reminder that Impulse! the label hat John Coltrane was signed to, saw him as a mainstream jazz musician . John Coltrane had other ideas. In 1962, John Coltrane had joined forces with Eric Dolphy and released the album Live At The Village Vanguard. This was much more representative of where John Coltrane was musically at the time. By then, he was leading what later became knowns as his classic Quartet. The lineup featured drummer Elvin Jones, double bassist Jimmy Garrison and pianist McCoy Tyner who all feature on a new three disc box set 1963: New Directions that has just been released by Impulse! It features John Coltrane at the peak of his creative powers on what was a pivotal year of his career. This was very different from 1962, which musically wasn’t a vintage year for John Coltrane. He had also struggled with the mouthpiece of his tenor saxophone and rather than persevere, had some work done on it. This ruined what was a perfectly good mouthpiece. To make matters even worse John Coltrane was also experiencing marital problems, and watched as his marriage broke down. It was no surprise that John Coltrane was pleased when 1962 gave way to 1963. It offered a new start for him, and on the ‘5th’ of March 1963, John Coltrane and has classic Quartet played a barnstorming set at Birdland, and was one of their best sets since they started out in 1962. Buoyed by this, the Quartet was ready to record a new album. John Coltrane and his classic quartet arrived at the Van Gelder studios in Englewood Cliffs, on the ‘6th’ of March 1963, and the band were in good spirits after their barnstorming set at Birdland the night before. It was without doubt one of their finest sets and this set them up nicely to record a new album with Rudy Van Gelder, which would be released by Impulse later in 1963. Bandleader John Coltrane planned to record an entire album during the session, which was something he had done many times before, and so had the other members of the quartet.This time, John Coltrane planned to record an album that featured mostly his own compositions. He had written Slow Blues, One Up, One Down and Villa which was based on Franz Lehár’s Vilja Song from The Merry Widow. John Coltrane planned to revisit another of his compositions Impressions, and had decided to cover Nature Boy. However, John Coltrane knew from experience that anything could happen when he was recording an album. That proved to be the case, and John Coltrane and his classic Quartet recorded several takes of each track, including those that feature on disc one of 1963: New Directions. The classic Quartet deliver a series of restrained and stunning performances on Takes 3 and 5 of Villa, Nature Boy and on the four takes of Impressions. These four tracks are a reminder of just how versatile and talented the four members of the classic Quartet were. They had an almost telepathic understanding as Takes 1 and 6 of One Up, One Down which close the disc one show. Apart from the thirteen tracks on disc one, eight of the ten tracks on disc two were recorded on the ‘6th’ of March 1963. This includes an eleven minute epic version of Slow Blues, the beautiful After the Rain and tracks of the quality of Autumn Serenade and After The Rain. However, not every track on disc two features the classic quartet. In April 1963 drummer Elvin Jones had to enter rehab to deal with his drugs problem. Roy Hayes seas brought in to deputize for him and can be heard on Dear Old Stockholm and a cover of Billy Eckstine’s I Want to Talk About You which was recorded live at the Newport Jazz Festival in July 1963. However, many jazz aficionados familiar with the two drummers’ work will be able to spot the difference in styles between Elvin Jones and Roy Haynes. Opening disc three are two more live tracks from the Newport Jazz Festival, including a fiery and inventive seventeen minute version My Favorite Things where John Coltrane switches to soprano saxophone. There’s also a fifteen minute version of Impressions where John Coltrane explores this familiar tracks as he returns to tenor saxophone and plays with an inventiveness and aggressiveness.Elvin Jones returns on The Promise, a lengthy and laid-back eight minute exploration of I Want To Talk About You and Mongo Santamaria’s classic Afro Blue featured on the original Live at Birdland. So do Your Lady which references John Coltrane’s future wife Alice, and make the start of his spiritual side. However, the most poignant and thought-provoking track is Alabama, which was written for the four African-American girls killed in the despicable bombing of a church in Birmingham, the previous September. This proves a ruminative way to close disc three 1963: New Directions, at the thought of barbarian racists murdering four innocent girls in a place of worship. 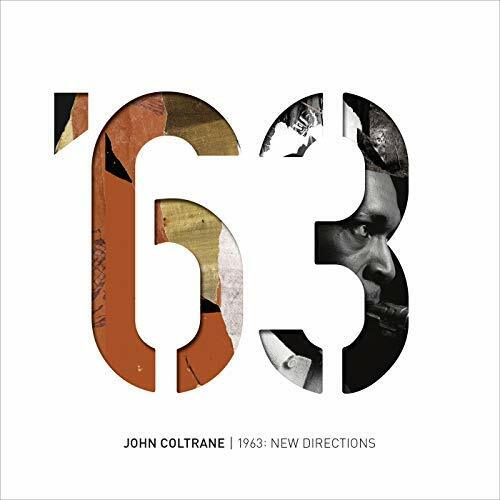 For anyone with even a passing interest in John Coltrane’s music 1963: New Directions is an important musical documents and acts as a roadmap for what was still to come. The classic Quartet were known for their versatility as their music continued to evolve. This included on his two spiritual masterpieces Crescent and A Love Supreme. They were followed by explorative Ascension and Meditations, which saw John Coltrane continue to push and stretch the boundaries of what was the regarded as jazz. However, by 1965 John Coltrane music had moved on the direction of avant-garde period which was the direction his music headed until his tragic death on July the ’17th’ 1967 aged just forty. That day, jazz music lost one of its greatest saxophonists who left behind a rich musical legacy including the music which features on 1963: New Directions which documents a landmark year for John Coltrane and his classic Quartet as they continued to write their way into jazz history. ← LED ZEPPELIN-THE SONG REMAINS THE SAME-VINYL.